Pope Francis will have to look extra hard to see what's special about his Christmas present from Lithuania. Lithuania's government and researchers in the capital Vilnius announced on Friday that they sent Francis a nativity scene that is invisible to the naked eye. The scene is a replica of the life-sized creche located in Cathedral Square in downtown Vilnius. Lithuanian President Dalia Grybauskaite posted a picture on Twitter of herself using a microscope to view a copy of the one that was sent to Francis earlier this month. Pope Francis will spend the holidays in the Vatican. Although he'll have fewer work meetings, more traditional ceremonies await him. 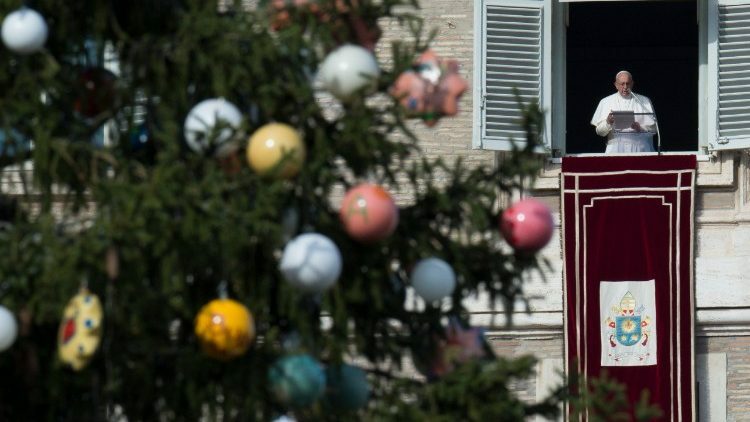 On Christmas Eve, the pope will celebrate the “night before Christmas” Mass at 9:30 p.m. The Mass, which welcomes diplomats and pilgrims, concludes with the moving procession of the baby Jesus. 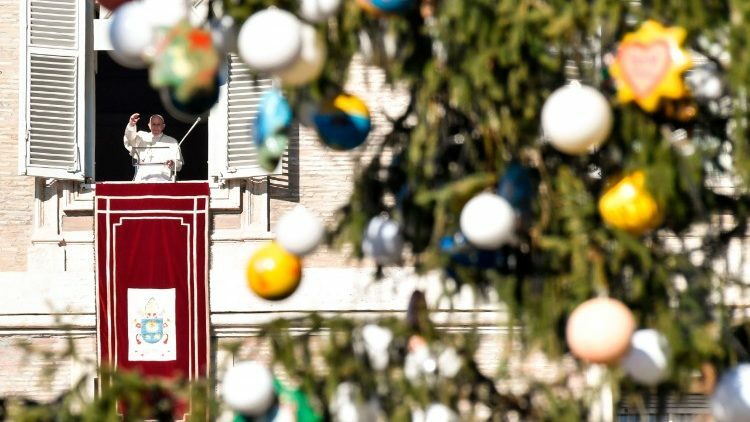 At noon on December 25, the Holy Father will give his Christmas message from the basilica's central balcony and share the “Urbi et Orbi” blessing, which is reserved for the two most important Catholic feasts – Easter and Christmas. On Christmas Eve, which this year falls on the Fourth Sunday of Advent, Pope Francis reflected on the Annunciation during the weekly Angelus. The Holy Father noted the contrast between “the promises of the Angel and Mary’s answer.” The Angel’s greeting is a long revelation, which becomes even more detailed in response to Mary’s request for an explanation. The Child that will be born of this humble girl from Nazareth will be called the Son of the Most High: it is not possible to conceive a higher dignity than this. Mary “gave birth to her firstborn son and wrapped him in bands of cloth, and laid him in a manger, because there was no place for them in the inn” (Lk 2:7). In these plain and clear words, Luke brings us to the heart of that holy night: Mary gave birth; she gave us Jesus, the Light of the world. A simple story that plunges us into the event that changes our history for ever. Everything, that night, became a source of hope. Pope Francis has appealed for peace and for a world in which children across the globe may be able to hope for a future of justice, security and joy. 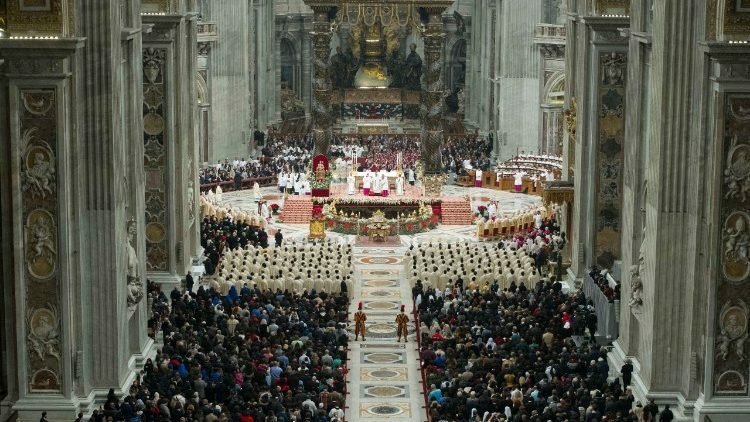 The Pope's words came on Christmas Day as he addressed the city and the world during his traditional "Urbi et Orbi" message from the Central Loggia of St. Peter's Basilica. Pope Francis said that Christ’s coming into the world means we must “convert” and change our way of thinking. The Holy Father was speaking ahead of the Angelus on Tuesday. In Italy, and in many countries throughout the world, the day after Christmas, which commemorates St Stephen, the first martyr, is kept as an important holiday. In his reflection, Pope Francis said the connection between the birth of Jesus on Christmas, and the martyrdom of St Stephen the following day, might not seem clear – but in fact, there is a strong link between them. Stephen was martyred, he said, because of his firm faith, and proclamation, of the “new presence of God among men.” He knew that Jesus, “the eternal Word come to dwell among us” was the true temple of God. Pope Francis visited Pope Emeritus Benedict XVI Thursday afternoon to personally give his Christmas greetings to the Pontiff Emeritus at his residence at the Mater Ecclesiae Monastery in Vatican City, reported the Holy See Press Office. As has become their tradition, they prayed together briefly and then spent some time having pleasant conversation. The visit lasted about 30 minutes. For an outgoing missionary Church, Pope Francis says theological ministry is an urgent and important priority. The Holy Father stressed this to the Italian Theological Association which he met for the 50th anniversary of its founding, in the Vatican this morning. In his remarks, the Pope recalled how in these days, we are immersed in the joyful contemplation of the mystery of our God, Who “has become so involved and compromised with our poor humanity” that He sends His Son to us, taking on our flesh. After 50 years of dedication, the Pope thanked the theologians for the contribution they have given to theological development and to the life of the Church. If you watch the Christmas Eve Mass at St. Peter’s Basilica in the Vatican on TV Sunday, you may want to pay extra close attention. For the first time, the keyboard sounds of “The First Noel,” “Oh Come All Ye Faithful” and other seasonal hymns that fill the giant church will be coming from an organ produced by Allen Organ Co. The Macungie company’s instrument is now the exclusive organ of the Sistine Chapel Choir, the pope’s personal choir. But beyond accompanying the pope’s choir, the GeniSys is movable and will be used for performances around the Vatican complex. Allen Organ President Steven A. Markowitz said the organ will make its worldwide debut Sunday during the special Christmas Eve liturgy. Parents must help their children to mature, Pope Francis said on December 31, 2017, in his address before praying the Angelus with the crowd gathered at noon in St. Peter’s Square. He noted that the growth of children is a great joy of the family. ROME - An odd thing about being pope is that while St. Peter’s Square belongs to you, you can’t just pop over and stroll around like an ordinary person. Doing so would cause security nightmares, and likely would also become a mob scene upending whatever sense of relaxation or spiritual repose might have been the aim. In his homily at Vespers in St Peter’s Basilica, Pope Francis thanks all Rome’s residents who strive to promote the common good in the Eternal City. Leading a celebration of Vespers in the Vatican Basilica on Sunday afternoon, Pope Francis spoke of his gratitude for the many ways in which Rome’s residents have worked to promote the common good of the city over the past year. 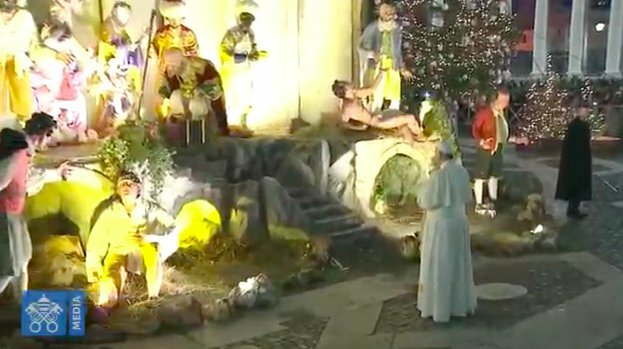 The celebration concluded with the singing of the traditional Te Deum, after which the Pope went outside and spent a few moments greeting well-wishers and praying in front of the life-sized Nativity scene in St Peter's Square. The Pope began his homily at Vespers by reflecting on the “fullness of time” when the Word was made flesh through the birth of the Christ child. Mary, the Mother of God or Theotokos as she’s called in the Orthodox world, was the first to experience that sense of fullness, the Pope said, as her humble heart and her whole being was “saturated with the Holy Spirit”. From Mary, he continued, the Church inherits this inner perception of fullness which nourishes a sense of gratitude as the only human response to God’s great gift for us. In this spirit of gratitude, he said, we lift up to God our thanksgiving for the year that draws to a close. As we look back over 2017, Pope Francis said, we must recognise the many ways we have wasted and wounded God’s gifts “with works of death, with lies and injustices”. Wars are the flagrant sign of this backsliding and absurd pride, he said, but so are all the small and great offenses against life, truth, and solidarity, which cause multiple forms of human, social and environmental degradation. But the Pope also expressed his gratitude to all those living and working for the common good in the city of Rome, seeking to “do their duty”, to “respect public places”, to “point out things that are wrong” and to “pay attention to the elderly or those in difficulty”. In particular, he praised the work of all parents, teachers and educators who try to train children and young people in a civic sense and an ethic of responsibility. Though they may not make the news, he said, they are the majority of Rome’s residents, striving to do what they can, even though many live in difficult economic conditions. Today, in thanksgiving to God, the Pope concluded, let us all express our gratitude for all these craftsmen of the common good, who love their city not only with words but also with deeds. Swiss Guard band plays as #PopeFrancis prays before the Nativity scene in St. Peter's Square. Devotion to Mary is “a requirement of the Christian life…not spiritual etiquette,” Francis concluded. He noted that it is important to “leave behind all sorts of useless baggage” and look to Mary to find what really matters. A link to the Message for the 2018 World Day of Peace is in the article. VATICAN CITY, JANUARY 1, 2018 (Zenit.org).- Here is a ZENIT translation of the address Pope Francis gave today, before and after praying the midday Angelus with those gathered in St. Peter’s Square. On the first page of the calendar of the New Year, which the Lord gives us, the Church puts as stupendous miniature the liturgical solemnity of Mary Most Holy, Mother of God. On this first day of the solar year, let us fix our gaze on her, to take up again, under her maternal protection, the journey along the paths of time. Today’s Gospel (Cf. Luke 2:16-21) takes us back to the stable of Bethlehem. The shepherds arrive in haste and find Mary, Joseph, and the Child, and refer to the proclamation given to them by the Angels, namely, that that Newborn is the Saviour. All are astonished, while “Mary kept all these things, pondering them in her heart” (v. 19). The Virgin makes us understand how the event of Christmas is to be received: not superficially but in the heart. She indicates the true way to receive God’s gift: to keep it in the heart and ponder it. It’s an invitation addressed to each one of us to pray, contemplating and enjoying this gift that is Jesus Himself. It’s through Mary that the Son of God assumes corporeity. However, Mary’s maternity isn’t reduced to this: thanks to her faith, she is the first disciple of Jesus and this “dilates” her maternity. It was Mary’s faith that at Cana caused the first miraculous “sign,” which contributed to arouse the disciples’ faith. Mary is present with the same faith at the foot of the cross and receives as son the Apostle John. And, finally, after the Resurrection, she becomes the praying Mother of the Church, on which the Holy Spirit descends powerfully on the Day of Pentecost. As Mother, Mary carries out a very special function: she puts herself between her Son Jesus and men in the reality of their privations, indigence, and sufferings. Mary intercedes, as at Cana, aware that, as Mother, she can, rather, must make present to her Son the needs of men, especially the weakest and most disadvantaged. It’s in fact to these persons that the theme is dedicated of the World Day of Peace that we celebrate today: “Migrants and Refugees: Men and Women in Search of Peace,” so is the motto of this Day. Once again, I wish to make myself voice of these our brothers and sisters, who invoke for their future a horizon of peace. For this peace, which is a right of all, many of them are prepared to risk their life in a journey that in most cases is long and dangerous; they are willing to face toils and sufferings (Cf. Message for the 2018 World Day of Peace, 1). ROME, January 2, 2018 (LifeSiteNews) — Three bishops have spoken out against Pope Francis’ interpretation of Amoris Laetitia to allow some remarried divorcees access to Holy Communion, saying such a reading is causing “rampant confusion,” is “alien” to the Catholic faith, and will spread “a plague of divorce” in the Church. Bishop Athanasius Schneider, auxiliary of Astana, Kazakhstan, Archbishop Tomash Peta, Metropolitan of Astana, and Archbishop Jan Pawel Lenga of Karaganda, Kazakhstan issued a Profession of the immutable truths about sacramental marriage on December 31 as a “service of charity in truth” to the Church of today and to the Pope. This morning’s General Audience, the first of the year 2018, was held at 9:25 in Paul VI Hall, where the Holy Father Francis met with groups of pilgrims and faithful from Italy and from all over the world. Continuing with the series of catecheses on the Holy Mass, in his address in Italian the Pope focused his meditation, which Zenit has translated in its entirety below, on the penitential rite. The Vatican’s Dicastery for Promoting Integral Human Development has just completed its first year of activity. The Dicastery is an outcome of Pope Francis reform of the Roman Curia to overhaul and stream line the central administration of the Catholic Church here in the Vatican. The Pope announced the new Dicastery on 31 August 2016 with the release of his Motu Proprio “Humanam progressionem”(Latin for “Human Development”). He appointed Cardinal Peter Turkson, the President of the Pontifical Council for Justice and Peace to be its first prefect. The Dicastery came into effect on 1 January 2017, with the merger of four Pontifical Councils: Justice and Peace, Cor Unum, Pastoral Care of Migrants and Itinerant People, and Health Care Workers. Page created in 10.182 seconds with 19 queries.